Some followers of this blog may remember the “Da Vinci code” post I wrote more than a year ago about a trip to Paris, the Louvre museum and the Mona Lisa. 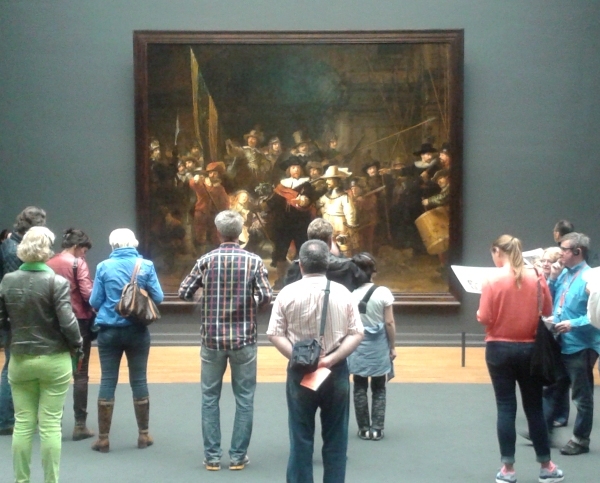 This past weekend we went visiting Amsterdam, the Rijksmuseum, and the Night Watch. For the unhappy few who are not familiar with the world’s art heritage: the Night Watch (or de Nachtwacht in Dutch) is a group portrait of a local shooting company, painted by Rembrandt in 1642. Our youngest son, who had been on a school excursion to the Dutch capital a few months ago, complained afterwards that the time they could spend at the Rijksmuseum was “barely enough for a meet and greet with Rembrandt’s famous painting”. So, he absolutely wanted to get back to the museum and spend more quality time with the works of Rembrandt Harmenszoon van Rijn and his Golden Age fellows. A good reason to return to the city of Amsterdam, isn’t it? It may come as a surprise to you, but Rembrandt’s world renowned painting is competing for the spot of the number one tourist attraction in Amsterdam with… a modest terraced house. The Anne Frank House is frequented by more than one million people each year. When we got there (following our visit to the Rijksmuseum), the waiting queue at the front door had already grown to over 100 meters long.